Many health conditions that occur during the senior years can lead to limited mobility. Whether your loved one had a stroke or lives with severe arthritis, you may discover that he or she can no longer enjoy certain favorite activities as his or her health decreases. While you might not be able to help your loved one regain mobility, you can keep him or her mentally engaged by suggesting one of these fun and safe activities. By the time people reach their senior years, they have a wealth of experiences that others could learn from. Encourage your loved one to record his or her favorite memories by writing them down in a journal or creating a digital book. If your loved one has limited dexterity, provide an audio recorder or offer to transcribe the story. Your loved one will enjoy many happy hours of reminiscing, and your family will have a beautiful keepsake when he or she completes the memoir. Writing a memoir is a wonderful way to boost mental and emotional wellbeing, and seniors should be encouraged to engage in other activities that good for their overall health. If your elderly loved one needs help maintaining healthy habits, consider hiring a professional caregiver. Tucson families can rely on Home Care Assistance to provide dedicated and compassionate in-home caregivers who are trained in our holistic Balanced Care Method, which was designed to encourage seniors to exercise often, eat nutritious foods, maintain strong social ties, and focus on other lifestyle factors that promote longevity. Active seniors sometimes face depression when they can no longer move around as much as they used to. Fiber arts provide seniors a way to release energy while seeing the tangible results of their efforts. Help your loved one explore arts such as knitting, crocheting, weaving, and macramé. Once your loved one picks out an art he or she enjoys, arrange for lessons or provide the supplies needed to keep up the new hobby. Your loved one’s finished projects can then be donated to people in the community or given away as gifts. Seniors who enjoy listening to talk radio should be introduced to podcasts. With the help of the latest technology, your loved one never has to wait for a specific time to listen to his or her favorite audio show. Instead, your loved one can listen to a podcast anytime he or she needs something to occupy his or her mind. Set your loved one up with an electronic appliance such as a laptop or tablet, then show him or her how to play a podcast. Later, make sure to follow up by asking your loved one to share a few things he or she learned from the podcast. A lack of mobility does not mean your loved one can no longer contribute to society. In fact, many volunteer opportunities can be adapted to fit a variety of abilities. For instance, a senior who uses a wheelchair can serve as a greeter at public venues such as museums or may enjoy rocking newborns in a nursery. Alternatively, your loved one may foster a shelter pet until it finds a home. Finding new ways to help others gives your loved one a sense of purpose that enhances self-esteem. From volunteering at a local charity to managing basic household chores, seniors may need help with an array of tasks. The elder care services Tucson, Arizona, seniors need can vary. Some need assistance a few hours a day, while others require more extensive around-the-clock assistance. At Home Care Assistance, we tailor our care plans based on each senior’s individual care needs, and the plans can be adjusted at any time. Learning should be a lifetime endeavor, and seniors with limited mobility can attend college classes if they have assistance with transportation. Online classes are an alternative that allows seniors to further their education without needing to leave home. Help your loved one find a stimulating class so he or she can enjoy hours of discovering new ideas that lead to self-improvement. 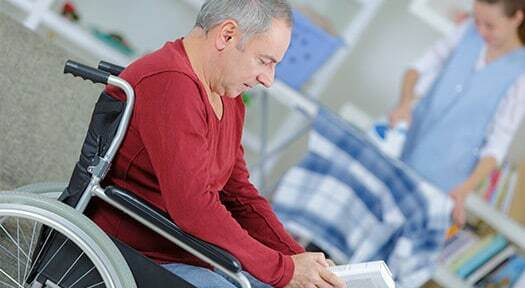 Seniors with limited mobility can age in the comfort of home and enjoy a high quality of life when receiving in-home care from a reputed home care agency. One of the most challenging tasks of helping an elderly relative age in place safely and comfortably is researching home care agencies. Tucson families can turn to Home Care Assistance for reliable, high-quality in-home care for aging adults. We offer 24-hour live-in care for seniors who require extensive assistance, and we also offer respite care for family caregivers who need a break from their caregiving duties. To schedule a free in-home consultation, talk to one of our friendly Care Managers at (520) 276-6555 today.